Ballyshannon, regarded as Ireland's oldest town, lies directly at the banks of the Erne River. There is good fishing for sea and slob trout right in the middle of Ballyshannon, at the Mall Quay. Here the long estuary of the Erne begins and is fishable right down to the Atlantic. Assaroe Reservoir lies just above the Hydro Power dam. Though there is a head of biggish brown trout in here, the water is better known for it's pike fishing. Specimen of over 35 lbs have been caught. In autumn a lot of big eels are caught here, when they are on their way back to the sea. The entire Erne estuary, by the way, can be regarded as good eel-water. Water levels can fluctuate and make the fishing unpredictable. Around Ballyshannon you will find about 30 lakes with a good stock of pike. Some hold also perch. Most of these water are easily fished from the banks. Lying directly on the Erne River in County Fermanagh, Belleek is the most westerly village in Northern Ireland. The town is bordered by Co. Donegal in the Rep. of Ireland. Belleek's main attraction is its picturesque location. This, combined with many areas of historical and natural interest, attract tourists from far and wide every year. Erne River, Assaroe Reservoir and Lower Lough Erne are very close, as well as numerous smaller lakes. Most freshwater-species found in Ireland can be caught in and around Belleek. 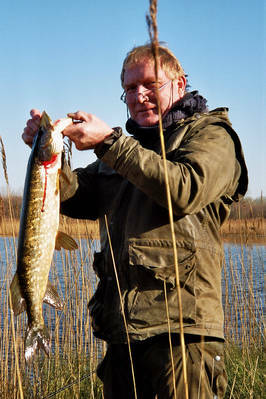 Particularly pike and eel fishing in river and reservoir attracts many anglers. The Bet, Part 2. Lower Lough Erne and the encounter. Not far from Belleek is Lower Lough Erne. It is famous for Brown Trout fishing, especially when the mayfly is up, from late May to the middle of June. 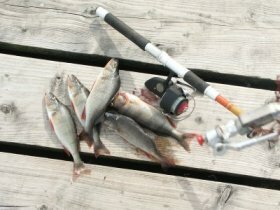 The lake is huge, 20 miles or so long and very deep in places, but most of the trout are caught in the shallow regions. A paradise for birds, wild flowers and fishermen, Lough Erne is a magnificent waterway for cruising and boating. In many places there are stiles and angling platforms for easy access to the waters. In general: the best trout fishing is at the lower (Belleek) end of the Lough. Closer to Enniskillen the coarse fishing takes over. Approaching the ancient town of Enniskillen from the water, makes you aware of the fact, that it is built on an island, separating Upper and Lower Lough Erne. The strategic importance of Enniskillen becomes obvious, when you come through the bridges and there is the Castle right in front of you, almost like a fortress. Good fishing can be found right in the middle of Enniskillen, either directly from the banks or from jetties. The town is known for great catches of bream and rudd and regularly hosts international competitions. There are tackle shops here and besides the right gear you can obtain all relevant information. The Bet, Part 3. Hungry on Upper Lough Erne and a feast in Fermanagh. Once on Upper Lough Erne, the straightforward layout of the river is pretty soon gone, there is nothing but , channels and water around you. All of a sudden one island looks like the other and you have at least three different routes to choose from. The Bet, Part 4. Getting lost somewhere and getting pissed in Ballyconnell. Just outside of Leitrim Village is the place where we met the mighty Shannon. There are some good coarse fish waters around Leitrim, some even hold tench. But the most common species would be roach and bream. Of course perch and pike are in these waters also. The Bet, Part 6. A nosh in Ballinamore and fake tenting. 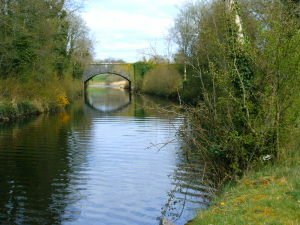 The Shannon-Erne Waterway is actually a series of canals, rivers and lakes. They link the two rivers. There are 34 stone bridges and 16 locks at the waterway. It is 63 kilometres long; that would be about 40 miles in real measurements. The Shannon-Erne Waterway was first built in the 1840s, but only very few boats used it then. Steam engine and railroad brought the transport of goods on Irish waterways practically to a halt. The banks of the canal soon caved in and grew over, making big stretches unship able. When my memory serves me right, the channels were renewed in the 1980s and 90s, then reopened in the mid nineties for recreational use only. The Bet, Part 7. Leaving the "Black Pigs" behind and rough tenting. The entire complex of the Shannon-Erne Waterway is practically coarse fish water, the canal itself can produce good fishing for bream, rudd and roach, but carries usually a lot of traffic and the many lakes seem to be the better option. Lough Garadice, Lough Scur, Ballymagauran Lough are all worth a try. For detailed information enquire locally. Angling centres are Ballyconnell and Ballynamore. The Bet, Part 8. Sore behinds on the Shannon and pints in Roosky. The Bet, Part 9. Stormy weather on Lough Ree and a culture evening in Athlone. Lough Ree is the second largest lake on the River Shannon system. It is a large limestone water of 10,500 hectares. 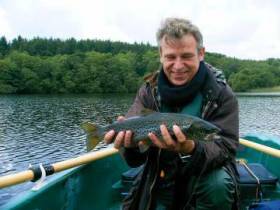 It is classed as a mixed fishery with good stocks of trout, pike and coarse fish. The trout average between 1lb to 2lbs. Straddling the Shannon at the southern end of Lough Ree lays the thriving town of Athlone, where old and new tries to find a harmonious blend. Below Athlone the Shannon widens and soon has broad reed margins on both sides. The pike fishing is excellent along the marina stretch of the river. There can be some good trout fishing right under the bridge in the town, particularly when the mayfly is up. Well worth a visit are the Castle and St Peter and Paul's church on the west bank of the Shannon. The Bet, Part 10. A bit of lilting and raw sausages in Clonmacnoise. The entire area is oozing history. It is an ancient site right in the centre of Ireland, was something like a crossroads or junction of river and road travel to the Old Celts. Saint Cierán built the first church here in the 6th century. Clonmacnoise developed into a very important centre of religion, learning and trade. Missionaries went from here to Europe and founded monasteries there. They must have been pretty hardy people. All the usual corse fish the Shannon produces can be caught here, pike, perch, bream. The Bet Part 11. A farewell at Bannagher and an unforgettable birthday. 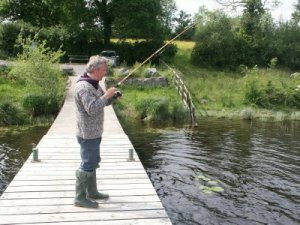 Banagher, located right in the heart of Ireland, has a lot of fishing to offer. River Shannon, River Brosna, Lough Derg, Lough Allen and the Grand Canal. The relatively unpolluted waters are home to all types of fish-even the occasional salmon, but perch, pike, brown trout, bream, eels, roach and rudd are regularly caught. Portumna is located on the River Shannon at the Northern end of Lough Derg in Co Galway. There are several angling hotspots, a good few of them are official match stretches. They are on the river Shannon itself and the famous Northern Shores of Lough Derg. The Bet, Part 12. It has been a long way to Tipperary. Spring fishing can be brilliant when shoals of Roach and Hybrids leave the vast waters of Lough Derg and move upstream into the river around Portumna. Lough Derg was once a great trout fishery, but has declined somewhat in recent years, the fishing is not what it used to be. For more information on the Erne-Shannon complex use the search facility and have a look at our Diary section.